Creating accessible materials to enable people to make choices about the NHS population screening programmes is an important requirement of the Accessible Information Standard and the PHE Screening Inequalities Strategy. Over the past 2 years, the PHE Screening division has been working to develop new and improved easy guides for the national screening programmes. 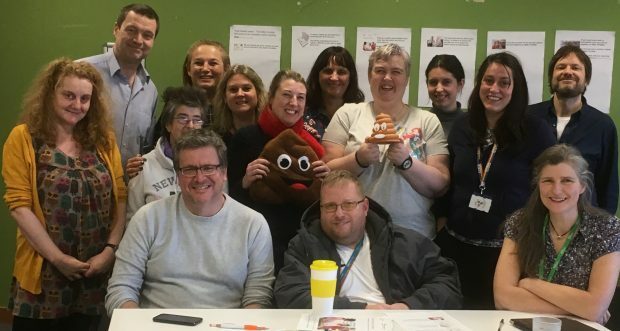 For the most recent workshop, the PHE team travelled up north to work on new easy guides for cervical and bowel cancer screening with people from across the North East and Cumbria. The sun was shining for the event at Waterfront 4, Newcastle, where the North East and Cumbria Learning Disability Network is based along with the NHS England and Health Education England regional offices. Our network has lots of links into the community and we see value every day in working in partnership. Public involvement is an essential part of making sure we do the best we possibly can for the communities we support. For this workshop we brought together a group of people who use easy read materials – our experts by experience. This is an excellent example of our partnership work. It means that the very people who use the end products are involved in their development and design. In the morning, a group of women from across the North East looked at the new draft easy guide booklet and easy read invitation letter for cervical screening. National Cervical Screening Programme Manager Ruth Stubbs gave a brief overview of the cervical screening programme. We then worked in small groups to go through the draft materials and give our feedback. In between times we had plenty of good laughs too. It is really important people can have good information to help them understand screening. I enjoyed looking at the leaflet and letter and saying what I would change. Hopefully it will help people know about screening. 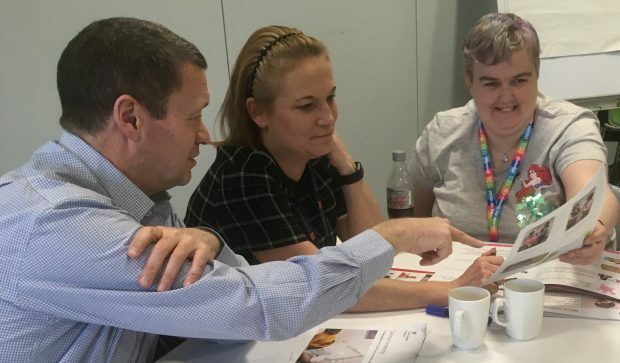 After lunch, a new group of both men and women came together to look at the draft bowel cancer screening easy guide which PHE Screening is developing with the help of Bowel Cancer UK. National Bowel Cancer Screening Programme Manager Karen Emery-Downing introduced the afternoon session and showed us the new faecal immunochemical test (FIT) kit that is being introduced into the national screening programme. We then split into small groups to go through the materials and offer our suggestions. It was a really useful session that will have a big impact.